Chocolate Milk, a band composed of five freshmen, brings out a fresh style of hip-hop that won’t go bad no matter how long it stays out. Consisting of members with musical roots in hip-hop, classic rock, jazz and gospel, Chocolate Milk blends all of these into a unique sound that goes beyond typical hip-hop music. Fronted by an occasional trumpet playing emcee, with the sounds of a tenor saxophone, bass, and drums brought together with tight production by an engineer and keyboard player, they give The Roots a run for their money. Chocolate Milk first started in Harrisburg, Pa., as a duo, when David Patrick and Andrew Aulenbach, both current freshman broadcasting telecommuications and mass media majors, were sophomores in high school. Patrick was beginning to hone his lyrical dexterity as an emcee, and Aulenbach was becoming adept at producing, as he had put together a studio in his basement the year before. They released their first project, “Free Your Mind and The Rest Will Follow,” but it wasn’t until they joined with drummer Justin Davis, a freshman business major whose roots are in gospel and jazz drumming, when they started to come up with creative and fresh material. In their senior year of high school, they released their first official album as a trio, “Sounds of the Dairy Section,” simultaneously coming up with the band’s name. “We were putting out our second album and thought it would probably be a wise choice to come up with a name. Due to the racial paradigm of our group, we thought Chocolate Milk was pretty clever,” Aulenbach said. 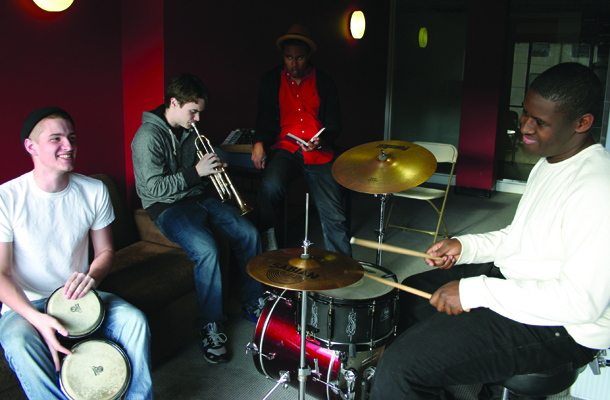 The three came to Temple in Fall 2009, where they met freshman jazz performance major Curtis Arnett, who plays tenor saxophone, and undeclared freshman Luke Reitz, who plays bass. They came together after seeing Aulenbach and Patrick perform at their student orientation. The addition of a saxophone and bass allowed for more intricate instrumentals, and with Arnett’s passion for jazz, and Reitz’s for hip-hop, Chocolate Milk’s sound evolved into one with a solid hip-hop sound with a heavy jazz influence. “Its not jazz theory, but a jazz philosophy” Arnett said. After becoming a quintet, Chocolate Milk started playing energetic live shows and started to build what has become a substantial fan base. The group’s love for music is evident in both the way they perform as well as in their philosophy. They continuously branch out to other musicians for new projects, such as jazz singers from Boyer College of Music and Dance, or other instrument players. Their true dedication however, is to their fans. “I don’t think we’ve ever made money off of performing or selling mixtapes,” Aulenbach said. The reason for the band’s commitment is the members’ dissatisfaction with hip-hop on the radio today. They said a lot of mainstream hip-hop is over-produced, and many emcees are lazy, often taking the easy route of a catchy chorus and meaningless lyrics, as opposed to the introspective lyricism found in a lot of underground or old school hip-hop. Some of their influences are A Tribe Called Quest, and of course, The Roots. “But getting signed to a label wouldn’t be bad either,” Davis added. As for long-term goals, Chocolate Milk will continue to put out music, and will always let their sound evolve as they progress. They say that their sound has changed substantially since they first started, a change no doubt reflective of their collective influences being put together. For the band, this is a very good thing. The band recently released their third album, “Drink Up.” More information can be found on the band’s Facebook page or on its MySpace page. Boyer’s Jazz Band Number 4 will perform at South Kitchen & Jazz Parlor on April 17.
my favorite is always Dark Chocolate, i do not like Milk Chocolate coz it is too sweet for my taste.;. It is the best time to make some plans for the future and it is time to be happy. I have read this post and if I could I want to suggest you some interesting things or suggestions. Perhaps you can visit my buy hand history website and write next articles referring to this article. I desire to read more things about it! I have found out a thing new on a range of weblogs each day. It’s always stimulative to see content material of other internet writers and learn somewhat some thing from them. Thank you sharing.